Kristin and the Cube - Kristin solves the cube really fast... and used to win contests for it when she was a kid! Kristin Solving the Cube - on the TV show That's Incredible, age 16. Kristin Solving for Celebrities - 30 years later, on JoCo Cruise Crazy, Kristin solves the cube for Mike Phirman, John Roderick and Peter Sagal, while Jonathan Coulton and David Rees watch on. Rubik's Cube Art - Jake, and others, have been creating cube pictures in the game room window at Wunderland.Earth. How to Solve the 5x5x5 Cube - Jake has written up his solution for solving the 5x5x5 cube. Custom Cube Technology! - Kristin has the technology to make beautiful custom cubes. "That's Incredible!" 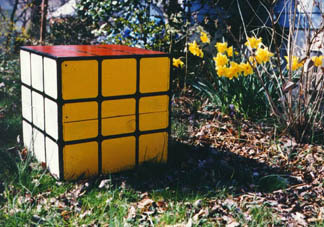 - Kristin was on TV solving the cube back in 1981, she placed 5th in the nation! How to Solve the Cube - Matthew Monroe teaches the same method for solving the cube that Kristin uses. How to Solve the Cube - Lars Petrus uses a different speed cubing method, with awesome Java aplets to walk you through it.